Trump's tweets can't stop this juggernaut. 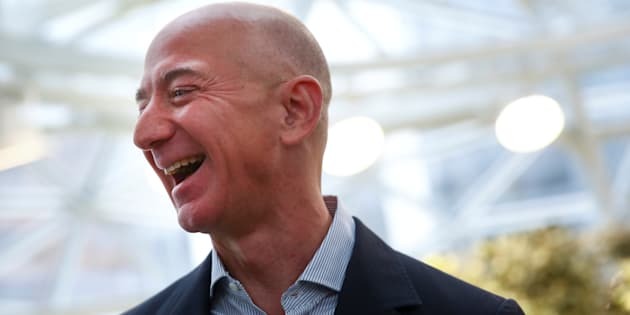 Amazon founder and CEO Jeff Bezos laughs as he talks to the media while touring the new Amazon Spheres during the grand opening at Amazon's Seattle headquarters in Seattle, Wash., Jan. 29, 2018. Jeff Bezos, by far the world's wealthiest person and one of Donald Trump's favourite Twitter targets, got $12 billion richer overnight, after Amazon announced stronger-than-expected earnings — and a hefty price hike for new subscribers to its Amazon Prime service in the U.S.
Bezos added $12 billion to his fortune as shares in Amazon spiked on Thursday. His net worth rose to a stunning US$134 billion, according to the Bloomberg Billionaires Index. Investors were happy with the news the online retail giant had increased sales in the first quarter of the year by 43 per cent, to US$51 billion. Profit more than doubled, to $1.6 billion. Investors also liked the sound of Amazon's announcement, on its earnings call, that's it's hiking the price of its Amazon Prime service by 20 per cent in the U.S., to $119 a year from $99. The hike will apply to new subscribers starting on May 11. But the price hike, for now, is limited to the U.S. Amazon told 680 News that it's not hiking prices in Canada, where a Prime membership will continue to cost $79 a year. Jeff Bezos Screws Over Workers At Amazon. Now He Wants To Do The Same At The Washington Post. Analysts were positively glowing about the company following its earnings release, with across-the-board increases in their outlooks for its stock price. In other words, Bezos stands to get a whole lot richer. And the analysts didn't sound too worried about consumers being put off by the price hike. "We do not expect the company to get much pushback from consumers given the increasing value of the service," J.P. Morgan analyst Doug Anmuth wrote in a client note, as quoted at CNBC.